Some foreclosure plaintiffs are trying to cash someone else’s checks. Some foreclosure plaintiffs are trying to cash checks that don’t belong to them, and forging evidence along the way to help them do it. And here’s the sneaky trick they use to get it done. Without it, the banking industry couldn’t exist: the Uniform Commercial Code, the law that tells banks how to handle checks and who gets to cash them. Before you cash your next check, take a look at the front. That part that says “Pay to the order of:” is pretty clear—it means that person, hopefully you, has the right to get money in exchange for that check. But that’s not the only important part. Flip it over and write your name. Somewhere on that check, usually the back, you signed that check, too. Maybe you just put your name, maybe you wrote “For deposit only.” Maybe you wrote “Pay to the order of…” and someone else’s name. All those markings are known as “indorsements” (sometimes spelled “endorsements”) and they instruct the person you give that check to, what they need to do with it. Just a signature? They can give you cash. Deposit only? Cash into your bank account. Pay to the order of someone else? Only that person now has the right to cash it. But the check doesn’t stop there. Unless you’ve presented that check to the bank it was drawn on—where the original maker of the check has an account—the bank or person you present it to has to then cash it themselves. Your indorsement to them, or if to no one, “in blank,” allows them to go ahead and present it to the next bank up the line. But they have to indorse it, too. 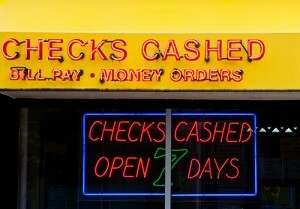 Eventually the check makes its way back to the bank on which its drawn, gets paid off and canceled. And if the check runs out of room for the indorsements necessary to get there, you can attach a separate piece of paper to provide room for more. This additional paper is called an “allonge,” and it’s the way a lot of foreclosure plaintiffs are trying to cash checks made out to someone else. Your home loan is the biggest check you’ve ever written. Most people don’t realize, when they borrow money for a home, that they’re writing the biggest check they might ever see in their lives. Because the promissory note that gives the terms of the loan is just like a check—it’s a promise, signed by you, to pay a specific named party a specific amount of money. And unless there’s an indorsement on the note that says otherwise, only the bank named in the note can demand payment. 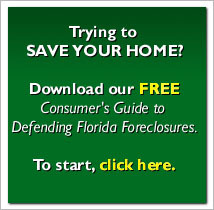 A recent case out of Collier County, Florida, along with another case I witnessed just a month later, shows that these huge checks borrowers wrote on their home loans are getting cashed illegally by many banks. In the Faulk case, reported by Professor Adam Levitin, and by Yves Smith, the mysterious “fourth page” of the note, containing the indorsement, hadn’t been filed with the court, but instead has floating around separate from the note and in possession of plaintiff’s counsel. And this apparently was just fine with Collier County Judge Monaco, who signed off on an order essentially approving that state of affairs. Judge Monaco’s tacit approval of manufactured allonges showed its head just a month later. I was in his courtroom for a foreclosure trial of my own. I watched the case ahead of me, in which plaintiff’s lawyer Jessica Serrano—just by coincidence, the plaintiff’s lawyer listed in the Faulk order—offered a note that was missing its allonge. The defendants’ lawyer objected while Serrano franticaly rifled through the file looking for the missing allonge. And then, she found it—filed with the court weeks later than the original note. It had never been attached to the note at all. You might want to take a voluntary non-suit. In other words, counsel, drop your case, fix your documentation, and come back. Although he couldn’t allow the plaintiff to win this case, it didn’t seem to bother the judge a bit that the plaintiff had knowingly filed an allonge separately from the note, and that they would likely come back with a new copy of the note as if the allonge had been attached the whole time. Here’s why this is important: in order to transfer a note, like a check, you’ve got to put your signature on that note. Signing a separate piece of paper and then later stapling it to the note—or not, as these Collier County cases show—doesn’t cut it. It’s just too easy to fake after the fact. And that’s why it’s not legal, and that’s why floating allonges in the court file or elsewhere are evidence that your foreclosure plaintiff is trying to cash a check that doesn’t belong to them. First of all, if your promissory note has any allonge at all, that’s a warning sign that someone’s playing fast and loose with your loan. The only legitimate reason to have an allonge is if there’s no room on the note to place a new indorsement—and that includes the back of the page. I’ve never seen a note that was so full they couldn’t fit another indorsement on it. One way to tell an allonge is fake: if the first indorsement on the page is to the bank whose letterhead is on the allonge. That means the recipient prepared it, and it probably never got lawfully signed by the original payee. Here’s a second way to tell an allonge is fake: It’s a full page-affair, spelling out all the details of the loan, the amount, the date, the borrower, and then has a signature block at the bottom. Why? Ask yourself this question: if the allonge is “firmly affixed” to the note as required by law, then all that information is in the note and there’s no need to put it on the allonge. You only need to spell out the details on the allonge if the note isn’t there when the allonge is created and signed, and you need to match them up later. Almost every allonge I’ve ever seen on a promissory note has that “loan data” effect. And that tells me they’re fake. The best way to tell an allonge is fake: if the plaintiff files the “original note” and the allonge seperately from each other. It happens more often than you’d think. And it happened to Jessica Serrano and Collier Judge Monaco at least twice in the last two months. Strange, how that happened.